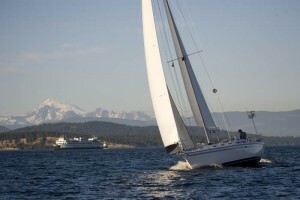 Rosario Strait is one of the first large bodies of water that most charter clients pass through on their way into the San Juan Islands. It is also a major shipping channel used by 500+ oil tankers delivering to the Cherry Point Refinery. So watch out for those big rigs that are traveling through! Rosario straight lends a great backdrop to the majestic Mount Baker that is featured in much of the photography that features our area. You have to admit, having that mountain hanging out in the background isn’t too shabby! She’s quite a beauty! In 1790 Spanish explorers Manuel Quimper and Juan Carrasco named the body of water Boca de Fidalgo., When it was realized that the body of water was in fact a strait and not a bay, it was renamed to Canal de Fidalgo in 1791. 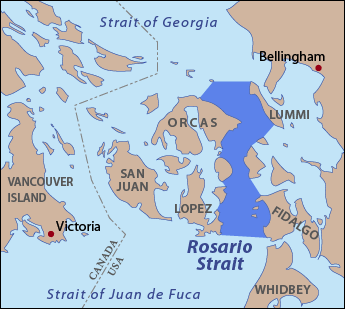 In 1847 Charles Wilkes, during the Wilkes Expedition, gave Rosario Strait the name Ringgold Channel after one of his officers. Then in 1847 the British Captain Henry Kellett reorganized the British Admiralty charts, in the process removing the “pro-American” names given by Wilkes and affirming pro-British names and Spanish names. He affirmed the name Gulf of Georgia (Strait of Georgia) given by George Vancouver and used a shortened version of Eliza’s name for the Strait of Georgia to replace both Wilkes’ and Eliza’s original names for Rosario Strait.